I’ve been reading, by chance, perhaps the most appropriate, and best, writer for an event like Slice of Life: Annie Dillard. Her new book of essays — In Abundance — is a collection of pieces from her various books and a few new ones thrown into the mix, but any reason to return to Tinker’s Creek with Dillard is well worth my time. Yours, too. She reminds us to see the world. Really see the world. To take notice. To be there, in the moment of nature. So I went out into my backyard, with Annie on my mind after finishing up The Abundance, to see what I might see and notice, and make note of. Excuse me for this attempt to steal her style of writing. I’ll do my best. Our fire pit has long been bruised. Before we arrived to reside in this house, someone — the former owner, we are told by neighbors, who watched with fascination on the event itself — took a sledgehammer to the fire pit, slicing off chunks of red brick. What’s left is still a place for fire, but it’s as if the brick are now reluctant at its task. Air comes in through gaps. Pieces are crumbling. Bricks keep getting smaller and smaller through the years. The New England winters take their toll. So do kids’ playing. I find pieces of the fire pit through the yard in summer, cursing as I avoid them with the mower. Someone used it as a baseball, probably, or part of the landscape of a rescue scene with Legos. I imagine one of these days, I will come outside and find in amazement that nothing is there where the pit was but some red dust, as if the whole of Mars had come for a visit, and maybe stayed for Smores and drinks. The place to build the fire will no longer be there. Just faint memories of nights under the stars, red embers in the fire pit. I take out the compost to the bin, which sits beside the crumbling fire pit, and notice how winter slows down everything. Somewhere in there, the worms are in slumber. Hundreds, maybe thousands, of worms call this black bin their home. They’ve buried themselves deep. The rich, black compost is their thick blanket against the chill. Who could blame them? Our bed is still piled high with layers of blankets and we have the warmth of the house. The worms have very little. Only decomposed material. Soon, though, the worms will stir, and no doubt be hungry, and our melon rinds and banana peels, and coffee rinds and tea bags, will nourish them as a welcome to Spring. Some worms will end up in our garden, a mass relocation effort with the goal of food for our mouths, too. In this way, we and the worms eat together at the same table. On the windward side of the fire pit, where it almost touches the compost bin, I notice two abandoned brown and striped husks dancing in the wind. 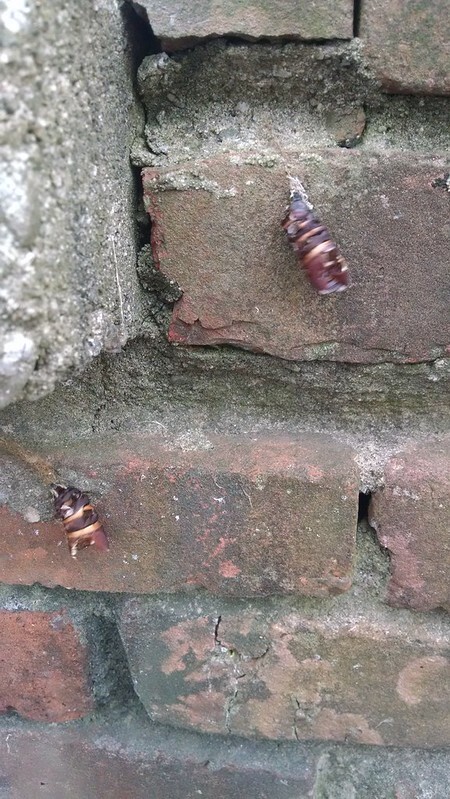 They look like bugs, dead from winter, but they are not. They are what the bugs left behind. One little thread connects each to the brick wall, and it feels that if I were to touch them, they might fall. Maybe even fly, they seem so light and airy. I resist the boyhood temptation to crush the husks, even though it reminds me of the bubble air pouches that come in valuable deliveries. You unpack the valuables, fair enough, and first turn your attention to the bubble wrap. Pop. Pop. Pop. Can anyone really resist that popping? You make the air whoosh, snap, pop. It’s an unlikely Zen moment. I’m tempted, yet I resist the husks handing on the wall, although I do wonder who stayed in there last and where have they gone to now? Were they ugly bugs now made beautiful by change? Or were they beautiful to begin with? The husks just keep dangling, with no clue for me to discern. I wander by the fence and notice the push mower. We only use this mower a few times each year, before the grass has really come in. Unlike our neighbors, we don’t use anything on the grass in our yard to help make it grow or be luxurious, so our backyard becomes the unexpected by early summer, with weeds and grasses and flowers and a wonderful wildness about it. 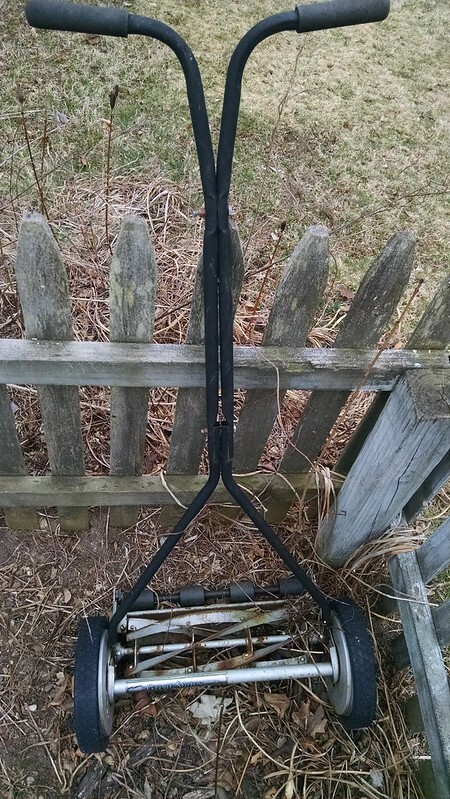 The few tufts of grass clumps, and wild onions, that are first to emerge from the soil aren’t enough for the larger mower, but this push mower does the job. Come summer, the mower by the fence will be overgrown with vines and weeds, so that it becomes a sculpture of the wildness of the backyard. It will be nearly impossible to move, so strong are the plants holding it in place. Now, however, the mower seems naked, vulnerable even. The weeds of last summer have long died off. The snow has melted. The grass is still quite some time from growing. It waits, patient. I am not. I move on. A flash of color catches my eye. One of the first flowers of winter, or spring, of whatever this in-between zone is that we find ourselves in these days. One day it is cold and the next day, warm, and none of us seems to really know what kind of jacket to wear in the morning. Will we be cold because we underdressed? Or warm because we overdressed? Make up your mind, Sun. This flower doesn’t seem to care one way or another, for it has forced its way up to the sun, and opened itself to the warmth of the world. 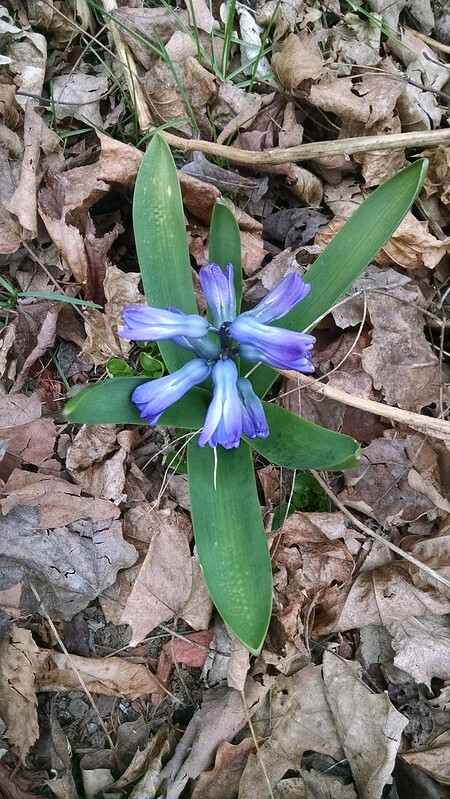 It may not last long, this flower, resisting the last vestiges of winter. While it’s here, though, it teaches us of the beauty of reaching for the sun and of the possibilities of wonderful things happening all around us, if only you remember to pay attention. 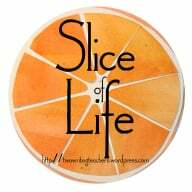 This entry was posted in books, Slice of Life. Bookmark the permalink. Having read a lot of Annie Dillard on recent years, I find in your writing the same celebration of the moment. The careful examination of the various elements within a particular setting. As an artist uses paint to colour a scene, a writer must use words. Writing under the influence of a mentor author and using the syntax is a practiced art. You have honored that in your piece Kevin. I enjoyed my reading. That means a lot, Alan, knowing how well you write with the same element of “notice” for your pieces. Thank you for visiting and taking the time to read and write with me. As always, I am grateful. I enjoyed reading your post. You made the ordinary extraordinary. I’m going to my bookshelf for my Annie Dillard book and find inspiration too. Annie Dillard is one of the first memorable books I read as a young adult. Her words were like magic in the way they truly opened up the world to me in a way I had never seen it before. I, too, had heard about the book and am eager to purchase it. Now I must! Your slice today is so rich and evocative. You’ve done yourself and Annie proud! This was great! I am reading Annie Dillard’s book now as well. I love your writing. I may have to give this a try this weekend. What fun! This is a wonderfully written slice! I slipped into a quiet mindset as I read your words; the world slipped away, and it was only your firepit and mower and yard for a few moments. Beautiful and thoughtful details shared; thank you! Love this. I haven’t read Annie Dillard since college, but she was hugely influential. I love the interplay of nature and thought in this.